LIAM WILLIAMS BELIEVES his fellow super welterweight Liam Smith is in for a tough night against the Mexican banger Jaime Munguia in Las Vegas this weekend, but suspects his old adversary has got what it takes to repel the fire of the 21-year-old and take the fight to the wire. Munguia stepped in to replace mandatory challenger Smith back in May when Sadam Ali – who defeated Miguel Cotto in his final fight – held the WBO world super welterweight title. Munguia caused something of an upset by flooring Ali four times on his way to a fourth round stoppage and the former WBC Latino champion must now fulfil the mandatory obligation against Smith. Munguia has only been taken the distance four times in his 29 fights so far, with three of those coming in his early four and six rounders. So Smith, as Williams suggests, is up against a bit of a puncher. “Yes he looks good and looks like he can punch a bit,” said the Welshman, who fought Smith twice in 2017, losing the first due to a severe cut and the second via a majority points decision. “It is a difficult one to call really because Liam is so tough and durable and he is actually a lot more skilful than people give him credit for. Williams, however, was at a bit of a loss when it came to actually picking a winner in a fight that will be screened live and exclusive on BT Sport 1 from 3am on Sunday morning from the Hard Rock Hotel and Casino. He might have struggled to pick a winner, but the 26-year-old did not hedge his bets when asked if he would like a shot at the winner. Williams is preparing for an expected September return in new surrounding under recently appointed trainer Dominic Ingle in Sheffield. “One hundred per cent I would fancy it with either of them,” he insisted. “Whoever wins, I can’t really see myself being in position to get the next shot, but I would certainly take it. “I am back on a roll now, I feeling good and I am re-motivated, which a lot of people didn’t realise I needed because I never really said anything. “Even for the second Smith fight I was lacking in motivation and didn’t really care enough. Don’t get me wrong, I wanted to win and I tried, but I didn’t have the motivation I should have had. LIAM SMITH will be fired up by critics who have trashed his chances of taking the WBO super-welterweight title challenge from Jaime Munguia in Las Vegas on Saturday July 21. The Liverpool boxer will be attempting to regain the title he lost against Saul ‘Canelo’ Alvarez in September 2016 when their clash drew 51,000 fans to the AT&T Stadium in Dallas. Munguia, 21, has won all 29 professional fights with 25 wins coming by KO. He caused an upset in May when he ripped the title from Sadam Ali – stopping the defending champion in four rounds. But Smith is ready to ruin the Mexican’s first defence at the Hard Rock Hotel and Casino and earn himself huge unification clashes that will set him up for life. Smith, 29, said ahead of the fight that will be shown by BT Sport: “I will be gutted if I don’t win this fight. “I am a little bit more hungry because a few people have written me off so I’m gonna make them eat their words. “Munguia is a good fighter. He is big for the weight and it doesn’t take a genius to see he can punch. “He is one of those young, enthusiastic fighters who is trying to make a statement in every fight and he’s just getting better and better. Smith whose only defeat in 28 fights came against Canelo is taking little notice of Munguia’s win against Ali. He explained: “Sadam Ali was in the right place, right time when he beat Miguel Cotto to win the title, but I still thought he might have had too much nous for Munguia. “I watched Munguia in February before there was talk of him fighting any of the names and classed him as a decent prospect who was coming through. “Apart from Sadam he hasn’t fought any one of note. If you look at his record there is not one other person there where you’d say, ‘Look he has beaten, him’. “The way the fight happened I wasn’t fully surprised because it was basically a middleweight against a welterweight. If Smith wins he will become the first two-time world champion from Liverpool and is the first scouser to top the bill in the world’s fight capital. 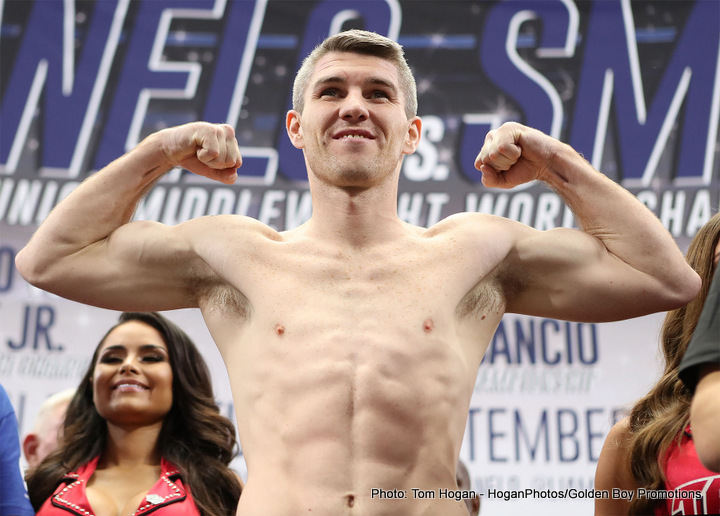 Liam Smith has his chance to reclaim the WBO world light-middleweight title when he faces champion Jaime Munguia at Las Vegas’ Hard Rock Casino on July 21. ‘Beefy’ (26-1-1-KO14) will fight in the capital of U.S boxing for the first time in his career against unbeaten Mexican Munguia, who boasts a stunning record of 25 knockouts in 29 bouts. Smith said: “To go to Vegas and fight for a world title is every fighter’s dream but it’s only an extra incentive to my main motivation – getting that WBO world light-middleweight title back around my waist. “Munguia is obviously a dangerous puncher and I’ll have to be wary of him early on but he’s never fought someone as good as me and a fully-fledged 154lb fighter. “I’ve been on record admitting I expected Sadam Ali to edge Munguia but I wasn’t at all surprised it ended as it did because Ali isn’t a proper light-middleweight. I am, and Munguia will find that out on the night. “Once I get that world title back in my hands, the world is my oyster and the big names will be knocking at my door. Besides unification offers, I’m sure I’ll have the likes of Amir Khan and Kell Brook wanting a shot. Smith had been due to take on Ali for the belt earlier in the year only to suffer an illness – but insists that frustrating experience has furnished him with even greater determination. Smith, who will be the first Liverpudlian to fight for a world title in Vegas, added: “We still haven’t found out where the illness came from. It was an allergic reaction to something but there haven’t been any clues from reviewing my diet. “I actually got over the allergic reaction quickly but when you’re talking about fighting for world titles at the top of the sport, you can’t go into the ring at anything less than your best.